Hi, my name is Brooke Schreier Ganz, and I am the president and founder of a non-profit organization called Reclaim The Records. We use Freedom of Information laws and open data laws to get copies of inaccessible archival record sets released back to the public, for free use. 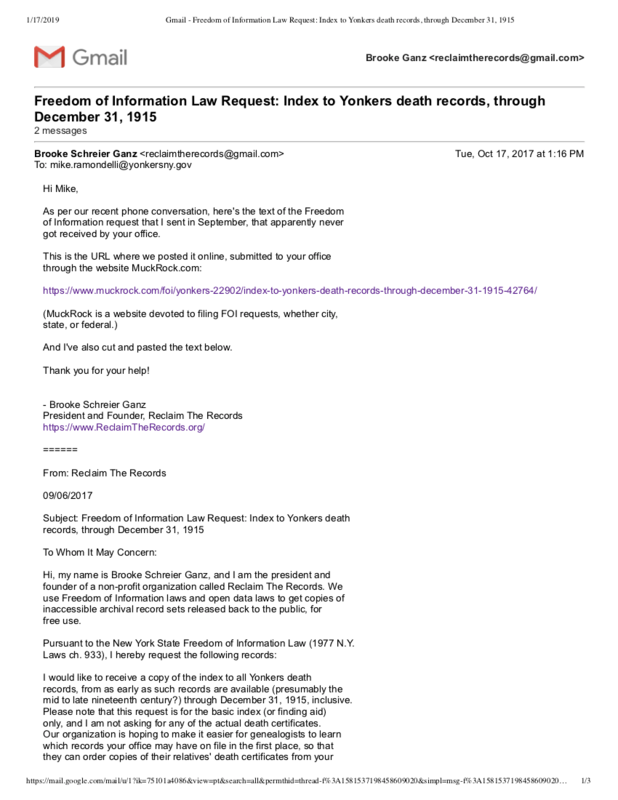 I would like to receive a copy of the index to all Yonkers death records, from as early as such records are available (presumably the mid to late nineteenth century?) through December 31, 1915, inclusive. 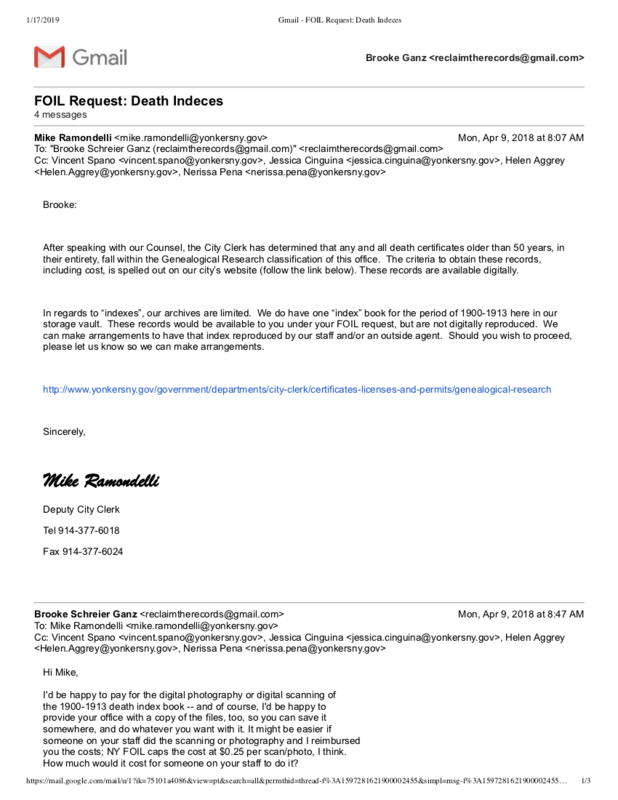 Please note that this request is for the basic index (or finding aid) only, and I am not asking for any of the actual death certificates. Our organization is hoping to make it easier for genealogists to learn which records your office may have on file in the first place, so that they can order copies of their relatives’ death certificates from your office or from the state. While vital records, including actual death certificates, are subject to privacy laws, the basic index to the records is required to be open to the public under the New York State Freedom of Information Law (FOIL). 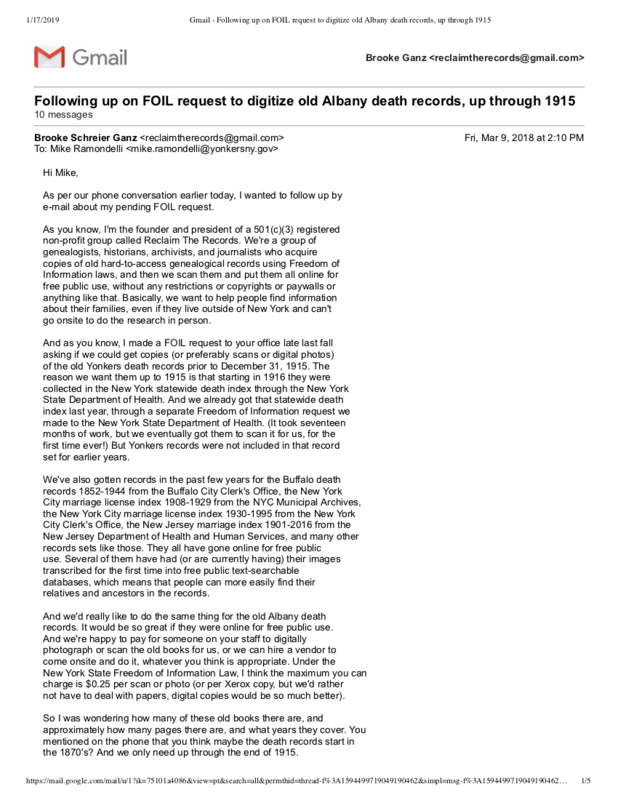 Almost two years ago, I filed this same request with the New York State Department of Health in Albany, asking for copies of their statewide death index. At that time, they only maintained their statewide death index copy in old-fashioned microfiche format, and only at a small number of upstate libraries. After a seventeen-month-long fight with them, including legal discussions with my attorneys and their Records Access Officers, the state finally conceded that an index to these records must be made available to the public under FOIL. I received my copy of the state death index from them a few months ago and our organization has recently put it online for free public use, at the Internet Archive. Having this digital copy of the index will help millions of people with New York State roots research their ancestors and order more record copies from the state. However, that statewide death index we won, which runs from 1880-1956, does not include any deaths for Albany, Buffalo, or Yonkers prior to about 1914 or 1915, because those cities weren’t great about compliance with the law. I would like to try to fill in the gaps in the online statewide file with your city’s information, so that people can track down their ancestors’ records and order copies from you. Please let me know in which formats you have this death index. If you have the data on microfilm, I will be happy to order copies of those, as it would probably be the easiest format to duplicate. If you have never microfilmed or digitized the index to your death records before, I would prefer that you scan or digitally photograph all the pages at a high definition. Because this is a FOIL request, I recognize that I will be required to reimburse your fair costs for doing this, either by using in-house staff at your office, or perhaps hiring an outside vendor to do the scanning or photography for you. I will also pay for the insured shipping of the record copies to California, if necessary. Please be advised that if you ignore or deny this request, our organization will take your office to court, under the New York Freedom of Information Law. 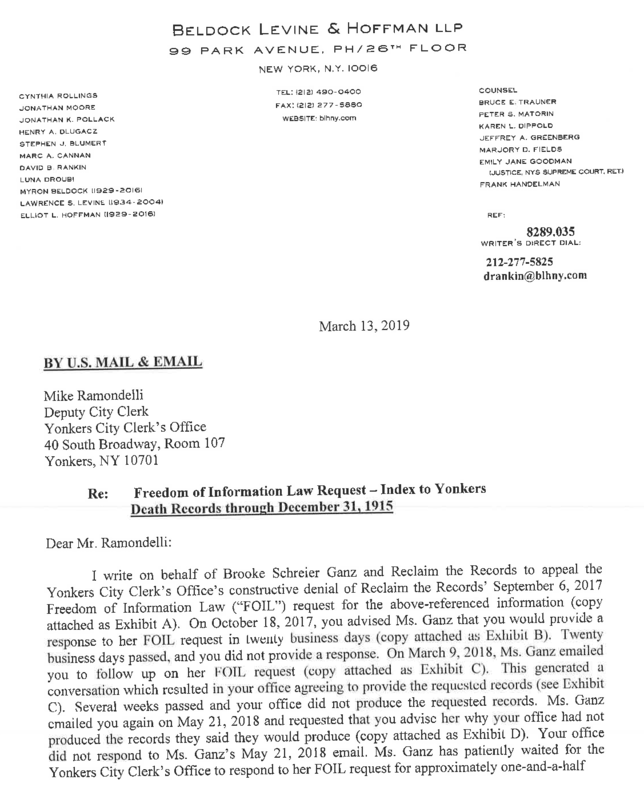 In the past three years, we have already sued two different New York City agencies for copies of genealogical records and won settlements both times, and even won our attorneys fees the second time. And we are currently engaged in litigation against the Missouri Department of Health and Senior Services, fighting for copies of their statewide birth index and death index. Hopefully, that kind of legal action will not be required in this case, but we did just want to point it out to you from the outset, so you would at least have fair warning. A FOIL request like this is not a favor, it’s the law, and we are willing and able to use the law. Please feel free to reach out to me directly if you have any questions or concerns about any part of this FOIL request. My phone number is [redacted] and my e-mail is [redacted]. Please inform me of any potential charges in advance of fulfilling my request. But then? They just stopped answering all our e-mails. They totally ghosted us. In January 2019, we started pulling together all the e-mails and photos and other materials for our attorney to finally file a FOIL Appeal, as our request has apparently been constructively denied. We submitted our appeal in March, 2019, and made it clear that we were done waiting around, and they would face a lawsuit if they didn’t comply. In our initial e-mails with Yonkers, they not only agreed we could have the index books copied, they even wanted to know our preference for the image file type. And Yonkers agreed to let us photograph the books! And then...they stopped responding to e-mails. Just totally ghosted us. a.k.a. "hi, this is your last chance to stop breaking the law before we sue"